De WAGO modulen die wij verkopen zijn ooit gebruikt in testopstellingen en/of nooit gebruikt in een opstelling maar wel hiervoor nieuw aangeschaft. De nieuwe modulen zitten nog in de originele gesloten verpakkingen. De reeds gebruikte modulen zijn niet meer dan twee weken gebruikt voor testdoeleinden. The input module directly connects to Pt resistance sensors.The connection of 2- or 3-conductor sensors is possible.The module automatically linearizes the entire temperature range. A sensor error is indicated by a red LED. The analog input module processes signals of a standard magnitude 0–10V. The input signal is electrically isolated and is transmitted with a resolution of 12 bits. The internal system supply powers the module. The input module directly connects to Pt resistance sensors. 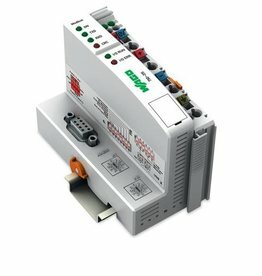 This digital output module transmits control signals from the automation device to the connected actuators. Field and system levels are electrically isolated. The internal system voltage triggers the relay. The NO contacts are electrically isolated. The switched status of the relay is shown by a LED. 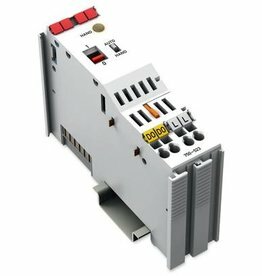 The analog output module generates signals of a standard magnitude ±10V. The output signal is electrically isolated and transmitted with a resolution of 12 bits. This fieldbus coupler allows connection of the WAGO‐I/O‐SYSTEM as a slave to the MODBUS or fieldbus. The internal system supply module increases the current supply for the internal system by 2A. 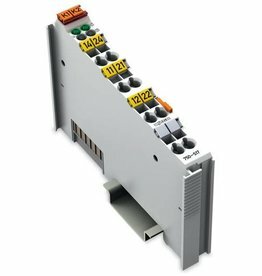 If the internal current consumption of all modules is higher than 2A, an additional supply module must be added. The analog input module processes signals of a standard magnitude 4–20mA. The counter is used for frequency measurement here, with the pulse period of the 24V signal being measured at the CLOCK input and then converted to a frequency value. Measurement is enabled and inhibited via the GATE input. 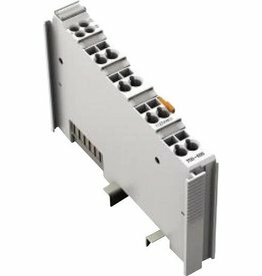 The end module for the internal data bus extension 750-627 is attached to the end of the I/O terminal block like the standard end module 750-600. The block is terminated with the module, to which a connecting cable can be attached with an RJ-45 connector. After the fieldbus node is assembled with the correct buscoupler and I/O modules, the end module is snapped onto the assembly. It completes the internal data circuit and ensures correct data flow. 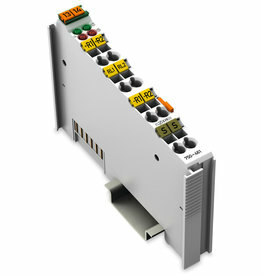 A connected actuator or load is switched via the relay output module. The 24 VDC supply is derived from the power jumper contacts to trigger the relays.